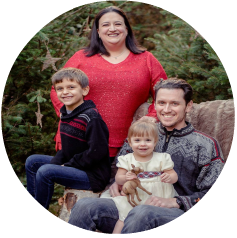 When: The blog hop starts on December 8,2013 at 6 AM, PST. However, you have until December 9, 2013, 11:59 pm PST, to leave comments on all the blogs (to be eligible for a prize). You should have arrived here from Dana Seymour’s awesome blog! If you happened to stumble upon the hop make sure to head back to Denami and start from the beginning so you don’t miss anyone’s blog. Now without further adeiu…here is my take on dazzle dazzle! I used a black card and then topped it with aqua glitter paper. I stamped the Denami trees on a piece of white misted with Heidi Swapp Tinsel spray to give it a cool winter feeling and then used my Denami glitter to make the leaves sparkle. I love how it came out!! Blog Candy!!! To anyone who leaves a comment on this blog, and becomes a follower, I will enter you in a random drawing to win this card and a stamp of my choosing! You can get an extra entry for following me on Facebook, Pinterest or Twitter. The links are all on the right hand side of this blog. Leave one extra comment with each place you followed me. Love the aqua sparkle. It gives such a wintery feel to your card. Beautiful! Oooh, that Tinsel Spray looks so cool! I love the BG for those glittery trees Lyne. Great card. Ohhh, I love it 🙂 How fun and sparkly!! Love all of the sparkly glitter – perfect for the hop. Love the trees!!! The colours are so pretty and fresh!! Lots of sparkle and pretty aqua! Beautiful! I can't believe you even found a sparkly button. Great card!!! Beautiful color choices!!! Very pretty! Thanks for sharing it with us!!! Oh, this is one of my favorite colors! This is some awesome glittery goodness! Love love seeing those pretty trees glitzed up! Your glitter is gorgeous, I love that color. The trees just sparkle. Very dazzling! I like the color. Your card is gorgeous! Love the color and all that sparkle! 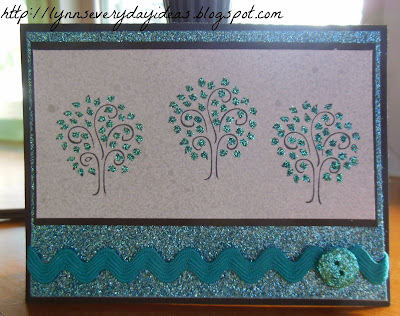 I love the glitzy paper and the beautiful trio of trees. Gorgeous! I love Denami!! Excellent hop! Thanks for the inspiration.I love your card! I am a follower of the Denami blog and have commented on all the participating blogs! Thanks for the giveaways!! Your tree look like they're filled with little twinkle lights! This is wonderful SO happy you could hop with us! What a glittery delight! I love the aqua color too. Love this sparkly winter creation!!! Beautiful work! I've always loved those trees, and this card is so sparkly and beautiful! Gorgeous card. Love the ric rac, glitter and the blue and white color combo. So much shimmer, love it! That tree is one of my faves! How gorgeous! I love those pretty colors and your creation truly does sparkle and shine! Very pretty!! I really like the design, colors and how the leaves on the tree stand out! Thank you Deb – that's exactly what I was shooting for. Heidi…I actually made the button. If you'd like to know how leave me a message on my FB page and I can do a video!